Summary: Get a new style for your hair. An easy way to style new hairstyles instantly and with ease. Find dozens of ways to style your hair. Tired of the same style? 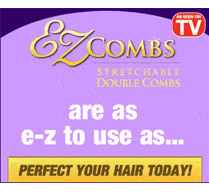 Try EZCombs, the easy new way to create dozens of new styles instantly. You can liven up a ponytail in just seconds. Create brand new hairstyles you never knew instantly. Great for proms, formal affairs or just a day out. Ideal for the office too. With EZCombs, they are so soft and comfortable that you can even sleep in them. EZCombs won't fall out even after a brisk workout.